Brought to you by the following Official Proud Sponsors: Town Of Shelburne, Abiding Place Fellowship, Shelburne Town Pharmacy, Shelburne Home Hardware & Building Centre, Dalton Electric, Shelburne BIA, Google & YouTube. Shelburne's Town Council Meeting held on Monday, September 28, saw public attendance at an all time high. Many issues were brought to the attention of Chief Administrative Officer (CAO), John Telfer, Deputy Mayor Geoff Dunlop, and Town Councillors, Wade Mills, Walter Benotto, Randy Chambers, Dan Sample , Tom Egan, Treasurer, Carol Sweeney, Deputy Treasurer, Carey Holmes, and Deputy Clerk, Jennifer Willoughby. Shelburne Town Planner, Steve Wever and Shelburne By-Law Officer were asked to attend the meeting in order to consult with regarding upcoming issues. Fiddleville Shelburne, Non Profit Housing Corporation, professionally managed by Bayshore Property Management were called upon as their Board of Directors, Trevor Lestor and Arlene Edwards presented a Property Management Report followed by a brief discussion of ongoing business. The report covered a large spectrum from corporate issues, financial issues, state of the building issues, tenant issues, budget review, energy saving initiatives involving switching to LED lighting. Bayshore Management will return to Council January 11, 2016 with further information required by council before moving forward, making the change to LED Lighting. Turnstone Contracting represented by Matt and Joe Bojin then proceeded to address Council seeking a solution to move forward with contacting agreements previously established. Upon discussion, Turnstone will continue to work with Shelburne's Town Planner,Steve Wever, and as soon as requirements have been met, the Town Of Shelburne will agree to move forward with further building commitments from Turnstone. Special Events Co-ordinator for the Town of Shelburne, Shawnette Crouse brought forth her very accommodating proposal to better utilize and organize the running of Shelburne’s baseball diamonds. Upon review, recommendations will be added and Crouse will follow up during the next town council meeting. The next issue at hand dealt with the Cedar Trees located on Cedar Street, their removal, and one Shelburnite’s sadness, yet understanding of the situation as the Town of Shelburne must install a water main. The situation doesn’t sound critical on one hand but on the other hand, the owner of the house which backs on to the row of cedar trees will lose privacy, aesthetics and a view he has come to love for twenty-three years. When initially brought to the attention of the Town, CAO John Telfer had the matter re-examined by engineers who delivered the news that the trees must go. In compensation, the home owner will receive a privacy wall and has reconciled to the loss of his trees. Most actions by the By-Law Officer are complaint driven as explained above, but what most people do not know is that the By-Law Officer can only act on powers he has been given, and those powers are surprisingly limited and governed by legislation. The By-Law Officer is restricted by legislation from acting on many situations that are very clearly, “wrong”. By-Laws must be changed and that is a real fight to be fought if Shelburnites want change. As is the case of large vehicles restricting a neighbour’s view, common sense and consideration for the safety of all involved is paramount. CAO, John Telfer announced that a billing session is coming in October and highly recommended those affected by this particular situation attend. 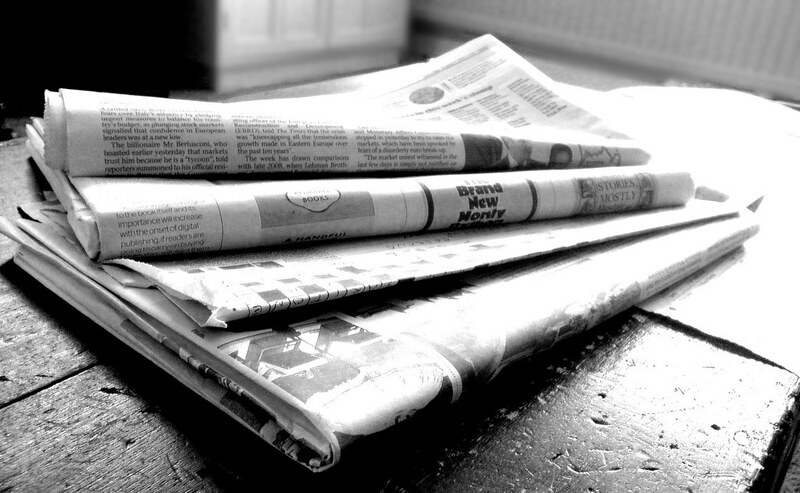 A rather large misnomer is the common misunderstanding that a complaint can legally be dealt with at our Town level. While many concerns actually can be dealt with, many cannot as even a little Town like Shelburne must adhere to policies and procedures in place legislatively and the only way to change that is to rally to change By-Laws and get more involved in your provincial parliament level. The final public issue announced was good news in that Call-A-Cab’s request for a wheel chair accessible taxi license was approved, a massive relief and welcomed amenity to wheel chair users in the community of Shelburne. The Council meeting began at 7 p.m. and most Councillor’s arrived home around 11 p.m.
(LtoR)Carey Holmes, Deputy Treasurer for the Town of Shelburne received an Award in Recognition of 20 years of Service in the AMCTO (Association of Municipal Managers, Clerks and Treasurers of Ontario. Shelburne Mayor Ken Bennington presented Holmes with the Award at the start of the Council meeting held on Monday, September 14, 2015. Many attended the wonderful grand re-opening of Pete's Deli located on the busy corner of Highway 124 and Highway 89, or 722 Main St. East., Shelburne. As the restaurants motto states, It's the Place Where Friends meet and the motto was especially true on this day. Having a new look is important to business owner, Helen Flemming and when asked if Flemming experienced less business due to new restaurants popping up, her answer was clear stating, " Not at all! There is enough business in Shelburne for everyone to grow! We offer a very different menu than Tim Horton's and we are offering different services." Flemming would like everyone to know Pete's Deli now offers a complete assortment of frozen food which are home cooked meals, they cater, and of course the daily meals are all home cooked and affordable. Store hours will be Monday to Friday from 5 a.m. to 8 p.m., Saturday and Sunday from 7 a.m. to 8 p.m.
Pete's Deli has a bright new look but it still is and always will be,"THE PLACE WHERE FRIENDS COME TO MEET!" (LtoR) Pete's Deli employee, Lorraine Raymond & customer Wendy Cruickshank enjoying Grand Re-Opening Day at Pete's Deli on Saturday, September 26. Each year Brenda Marshall, owner of Pazazz, a local fine women's clothing store, hosts an annual event called, The Joseph Ribkoff Trunk Show. The wonderful aspect about this show that fashionistas appreciate so much is the very same fact that most people do not know. Joseph Ribkoff Sales Representative, Meg Baginski arrives with Fall/Winter Fashions but also New 2016 Spring Fashion not even released yet. If you happen to be concerned that you are wearing 2015 spring fashion while travelling to somewhere already in 2016 fashion, your concerns are over. This amazing event allows women to try on and order whatever they want in whatever color, size, style they require. This event occurred on Friday, September 25th and while it may be disappointing for some who did not get to take advantage of this completely accommodating service, rest assured, the event will occur again next year. Joseph Ribkoff is a well known designer and the clothing is worn around the world. Thanks to Store owner, Brenda Marshall, women can rest assured they have access to the finest women's clothing which is always a shock to those who have never set foot in Pazazz. To treat yourself, surprise yourself, or even to try something new, take a visit to Pazazz and see what you've been missing! See you next year at the Josph Ribkoff Trunk Show Event! For more information call, (519) 925-3232. (Lto R) Josph Ribkoff Sales Representative, Meg Baginski and Pazazz Store Owner, Brenda Marshall. Find out why Terry Fox means so much to so many and the Terry Fox Run organized by Volunteer Joan Wallace is so successful! Find out what Ford is up to and how their Test Drive Challenge helped raise money for Shelburne Minor Hockey. (LtoR;Front) Padova Store Owner and Five Star Chef, Chef Chatal Meffie, Natalie Taylor, (LtoR:Back) Justin Poulin, and Kyle Ferris. What a fantastic day! The Shelburne Freelancer had the privilege to interview Five Star Chef, Chantal, Chef Meffie at her new Bakery And Deli, Padova! (And I messed up the name of the business! Holy smokes!) Such a great lady, great business and The Town of Shelburne and The Shelburne Freelancer welcome and wish all future success possible! (LtoR) First Timers to attend a Party Rocker Dance, Hayden White 10, Noah Coates 29, (according to him, but we think he's probably 10), and Kailynn Lemoine, 10. A little nervous, but ready to have fun! Shelburne's skate club called Skate Canada Shelburne hosts monthly Dances in the upper level of the CDRC( Centre Dufferin Recreation Complex) which are chaperoned by parents and are held as monthly fund raisers. Next week is the last week! Be sure to stop by and pick up your apples! Why Is The Shelburne BIA Farmer's Market So Important To This Mother-Daughter Dynamic Duo? So often local heroes walk right by us on the street and we never know it. Such is the case with (LtoR) Basia Knowlton and her daughter Shannon Knowlton, 29. Regular Vendors at the Shelburne BIA Farmer's Market, this dynamic duo sell creations they have designed, often without patterns, but for the most part sell crochet squares for 2$, but you don't get to take them home...you pay 2$ to have your name attached to a much larger and noble plan. Each week rain or shine, Basia and Shannon Knowlton set up shop and can proudly boast with the help of a venue so well trafficked as the Shelburne BIA Farmer's Market, they have sold enough crochet squares to construct 12 blankets. Simply because they are giving back. They are on a mission to sell as many crochet squares as possible, construct as many blankets as possible in order to donate them to Family Transition Place located in Orangeville. Life can change in the blink of any eye and suddenly one can find themselves,victims of abuse and in desperate need of protection, calm and a sense of "home". For this incredible crafter and her daughter, what could be better than providing warmth as well. September 23rd was the first week Shannon didn't feel well enough to attend the market and while this "Good Stuff Feature" was already in the works, hopefully Shannon will be cheered up by the article enough to attend the last week for Shelburne BIA Farmer's Market, October 1st. Keep your eyes open when attending the Shelburne BIA Farmer's Market , pay $2 for a crochet square and your good deed can help in ways you may not imagine, helping to provide a source of comfort that can become a keepsake when everything else seems lost forever. (LtoR) Terry Fox Run Volunteers, Tina Vanderveen, Bailey Vanderveen, Terry Fox Run Volunteer Co-ordinator, Joan Wallace and Volunteer, Diane Wallace. This year's Terry Fox Run is yet another spectacular success thanks to the endeavors of many Terry Fox Run Volunteers and it's Volunteer Co-ordinator, Joan Wallace. Click here to see the candid video interview with Volunteer Terry Fox Run Coordinator, Joan Wallace and find out why so many take the Terry Fox Run so personally! Click here to go to the Terry Fox Foundation website. Shelburne Mayor Accepts the Debra Ellis Challenge: Truly experience the trials and tribulations wheel chair bound individuals face daily regarding Sidewalk Accessibility and Safety Issues. Find more on sports page. Dental Fear? FEAR NO MORE! The Shelburne Freelancer is brought to you by the following proud official sponsors: The Town Of Shelburne, Shelburne Town Pharmacy, Abiding Place Fellowship, Shelburne Home Hardware & Building Centre, Dalton Electric, Google and YouTube. In an unprecedented act of 'Mayoral Duty', Shelburne Mayor Ken Bennington accepted, 'The Debra Ellis Challenge' which was to truly experience the trials and tribulations wheel chair bound individuals experience each day when attempting to navigate on the streets and sidewalks in the Town of Shelburne. Early Saturday, September 12, 2015, (Below LtoR Back) From Town Of Shelburne Public Works, Steve Woods, Chair of the Accessibility Committee and Shelburne Town Councillor, Walter Benotto, Accessibility Committee Members, Frank Hunt and Janet Manschitz, (Front Lto R) Mayor Ken Bennington and passionate Shelburnite, Debra Ellis gathered at Shelburne Town Hall to begin a trek through the streets of Shelburne discovering first hand the many issues that need to be addressed involving Accessibility and Safety. Part of the 'Debra Ellis Challenge' included Mayor Bennington actually using a wheelchair in order that he completely understand the accessibility and safety issues at hand. Steve Mason from the Town of Shelburne, Public Works, was on hand to mark areas of sidewalk concern and safety with orange paint to raise awareness and hopefully help people to notice areas where they should take caution. Soon after crossing the street from Town Hall onto William street, the Mayor was already becoming aware of the bumpy ride. The route then carried on to Robert St. where many issues were discovered, painted and discussed. In an admitted eye opening reflection, Mayor Ken Bennington realized, as a walking individual, he could never have truly known about the issues wheel chair users face but also broadened the experience to include parents using strollers, and those using walkers. What some residents may not be aware of is that the Town of Shelburne conduct a "walk- through" each year in order to ascertain which areas of concern to address first and then struggle to find ways to appease their limited budget. A complicated affair to say the least as what seems a simple issue becomes a mass of concerns spanning from guidelines and regulations to cost, liability, insurance, and many more factors come into concern including the fact environment and wear and tare play a huge role in sidewalk accessibility as some sidewalk panels naturally lower or raise following a winter season. Chair of the Accessibility Committee and Shelburne Town Councillor, Walter Benotto has been raising awareness for 15 years bringing up issues of Accessibility and Safety Awareness to Town Council and freely admits that while he would happily use his own wheel chair more if sidewalks were in better condition, it's an ongoing concern to find enough money and is perhaps an unrealistic goal to repair every sidewalk in the Town of Shelburne. Mayor Ken Bennington now hopes to realize an ongoing program of sidewalk accessibility and maintenance, continued awareness and is very appreciative of local resident, Debra Ellis for issuing the challenge. It has been said, "One cannot know another man's life until he has walked a mile in his shoes." Perhaps no truer statement has ever been said and still applies, even if that mile was covered in bright pink shoes with the use of a wheel chair. Note of interest, Mayor Ken Bennington proudly sports bright pink shoes in support of his mother who has battled Cancer and actually borrowed her wheel chair for the challenge, bringing the entire issue very close to home for the Mayor while clearly indicating the Town of Shelburne take issues of safety and concern very seriously. Perhaps the "Debra Ellis Challenge" may become the next ice bucket challenge for all Mayors to follow suit. A job well done by Mayor Bennington! If you want to attend Council Meetings and keep current on issues, visit the website for more information and click below. (Left ) Watch the video of Mayor Ken Bennington as he experiences, "The Debra Ellis Challenge". Are You Too Afraid To Go To the Dentist? Personal Editorial Review of Small Town Dental! Are you one of these? (R) I certainly am! Ashamed to admit that I haven't been to a Dentist in years, fear, cost, putting the children first, and any other excuse I could find, were all coping tools to deal with my fear of any Dentist. After covering Small Town Dental's Grand Opening, and meeting Dentist, Dr. Gewarges and his staff, I discovered many things about the practices and standards of this particular Dental office, all of which were very high, modern, caring, compassionate, hygeinic, and frankly nothing to to fear. Of course, that sentiment fell to the wayside when I finally came to realization I had to have a wisdom tooth pulled. For anyone who doesn't remember the Dentist torture scene in the movie, Marathon Man, featuring Dustin Hoffman, I borrowed this snippet from www.virginmedia.com. which is what kept flashing in my mind repeatedly and irrationally. Yup! Pretty Silly! Instead of this guy featured above, you too can be greeted by these fine people below, (LtoR)Cindy Savoie, Blaise Menier, Dr. Gewarges and Charlee Adams. From start to finish, Dr. Gewarges, also known as "The Singing Dentist" and staff do their very best to calm, or as in my case, practically sedate with kindness and freezing, all the while providing the best expertise. As a bit of a Jerry Seinfeld germaphobe type of non-huggy greeting person, I myself had to take a leap of trust to allow someone's hand in my mouth using a tool with a motor on it! Yikes! I just flashed Marathon Man in my mind again.. ok., better now. But all joking aside, from the non- judgmental approach upon first greeting,( which can be ruthlessly uncomfortable as some receptionists portray that face with the permanent smell under their noses when looking at someone who hasn't been to the Dentist in years- we all know that look!) to the lack of pain in receiving the needle for freezing, to the understanding that this group of professionals actually care and are working together as a team to ensure the ultimate end result is a healthy mouth, a happy smile, confidence booster, pleased and satisfied customer, all rare qualities in today's society. So eager to help, even financial arrangements can be made which is a huge concern and deterrent for visiting a dentist for so many in today's economy. In fact, many of Dr, Gewarges Staff come to have a a true affection for their boss as in the case when for no particular reason, Dr. Gewarges was presented with this gift from his staff. I am still an irrational chicken, but I know I am in great hands and am preparing myself for my next visit where I am looking forward to one of Dr. Gewarges renditions of, " Who Let The Dogs Out?! Who?! Who?!" Which goes something like, "Who Let The Cats Out..." See, even a big chicken like me can have an enjoyable experience. The Shelburne Freelancer gives ten thumbs up to Small Town Dental for their dedication, excellent dental professional skill, and their ability to calm adult chickens, adult babies and like me the most irrationally fearful. I highly recommend you consider Small Town Dental if you are looking for a Dentist. The entire experience reminds me of a sincere and genuine exchange and puts me in mind of a quote from the movie, Willie Wonka And The Chocolate Factory, based on a book by Roald Dahl, " And so shines a good deed in a weary world." 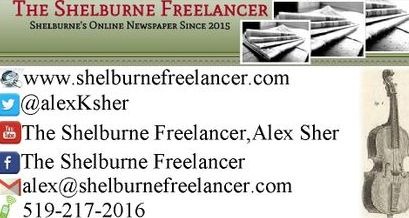 Many thanks from The Shelburne Freelancer, Alex Sher! See Shelburne's Favourite Little Snowman, William Jelly Belly visit Dr. Gewarges very soon! For more information on Small Town Dental, call, 519-306-3300 or visit their website by clicking on the button below. The Shelburne BIA Farmers Market is September Strong! For more information, visit The Brown's Music Time Machine Band on FaceBook. Click if you would like to know more! © 2015 The Shelburne Freelancer. All Rights Reserved.